There are approximately 150 of them in the United States, but chiropractic radiologists are little known to most people in medical imaging. Mention chiropractic radiology on an online message board or to a group of medical radiologists, and you’ll likely be met with questioning looks. But Doctors of Chiropractic (DCs) regularly use imaging technologies in their practices. 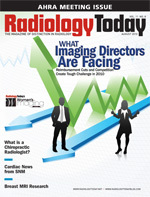 In most states, plain film radiography is within a chiropractor’s scope of practice, and many states allow a chiropractor to order and even interpret advanced imaging if they have the proper training and credentials, according to American Chiropractic College of Radiology (ACCR) President J. Todd Knudsen, DC, DACBR. Some larger chiropractic offices, especially those integrated with other healthcare professionals, may have diagnostic ultrasound or other imaging modalities available for their patients. Though laws vary by state, chiropractors are often free to order advanced studies such as CT, MRI, or ultrasound, according to Gary A. Longmuir, MAppSc, DC, DACBR, of Diagnostic X-Ray Consultation Services in Arizona. Many chiropractors rely on a chiropractic radiologist such as Longmuir to read and interpret films for them. According to the ACCR, there are approximately 150 chiropractic radiologists in the United States, with another 50 outside this country. Chiropractic radiology is a specialized branch of chiropractic healthcare. Similar to medicine, there are generalists and specialists in chiropractic, according to Knudsen. Most chiropractors are generalists, and most specialties in the field require additional training in the form of postgraduate seminars or full-time residencies—as is required with chiropractic radiology—and then board certification examinations to earn diplomate status. In the case of chiropractic radiologists, the examining board is the American Chiropractic Board of Radiology (ACBR), widely considered the most stringent of the specialty boards in chiropractic. Chiropractors who pass this certification process and maintain their continuing education requirements may use the designation of diplomate of the ACBR (DACBR). According to Knudsen, chiropractic radiology consists of interpreting, and sometimes performing, imaging exams such as plain radiographs, MRI, CT, and diagnostic ultrasound. Chiropractic radiologists are chiropractors who may own and operate consulting practices, treating practices, and/or imaging centers or teach in chiropractic or other colleges. Chiropractors complete 300 to 400 hours of training in chiropractic school to learn about acquiring and interpreting plain film radiography, with some rudimentary training in advanced imaging—more for the recognition of imaging type and to have a better understanding of reports they may get from a radiologist, according to Knudsen. Chiropractic radiologists complete approximately 4,000 hours of training in practical and didactic training during their three- to four-year full-time residencies, and they are certified by the ACBR, an autonomous examining agency not affiliated with the American Chiropractic Association Council on Diagnostic Imaging or the College of Radiology. This way there is no conflict of interest or undue influence, according to Longmuir. Chiropractic radiology residencies are conducted by schools accredited by the Council on Chiropractic Education (CCE). “The residencies themselves are not currently accredited; however, CCE has been discussing this possibility for years,” says Knudsen. Chiropractic undergraduates take classes in pathology, soft tissue x-ray, bone x-ray and pathology, MRI, CT, and sonography. If they want to become certified in radiology, that residency lasts for three or four years. For the duration of the residency, those training for this career must learn radiation health safety, bone pathology, chest imaging, gastrointestinal imaging, genitourinary imaging, and MRI. The certification exam consists of several days of testing before candidates are admitted to the ACBR and permitted to use the initials DACBR after their name. “I know of a number of DACBRs who have gone to medical school in addition to all the training I’ve just discussed,” says Longmuir. “These individuals have gone on to become medical radiologists or into specialized occupations in internal medicine, including a number of state radiation regulatory agencies. Longmuir has a full-time practice and a large number of doctors, including chiropractic, medical, and osteopathic physicians, for whom he reads studies. Typically a courier picks up and drops off imaging studies to his office that have been taken at chiropractic clinics in and around his area. He also has film studies sent by mail and DICOM files sent via the Internet or on CDs. A chiropractic radiologist’s scope of practice is the same as it is for every licensed chiropractor in each state. They have additional training in radiology, but they practice under a chiropractic license. Each state’s law defines the scope of practice for any chiropractor licensed in that state. Chiropractors in all 50 states can take x-rays and may refer those exams for interpretation, according to Longmuir. The scope of practice also permits them to order advanced imaging studies; whether a third-party payer provides coverage is a separate matter. Chiropractic radiologists are reimbursed by cash, lien, or insurance—like other chiropractors. “When it comes to billing, we can either bill for the primary read (the professional component of the x-ray services) or a second opinion,” says Knudsen. Chiropractors who do not have imaging equipment in their offices order the exam to be performed at an imaging center. Longmuir notes that his office is located above an MRI clinic. He interprets spinal and appendicular MRI studies for the facility, along with MRI studies from outside sent via the Internet, including international studies from places such as France, India, and Mexico. Each week, Longmuir catches roughly two fractures and one tumor in his work. Still, there is some criticism from medical radiologists that films from a chiropractor’s office are poor quality, usually because older machines are used. Tracy G. Hoyt, DC, DACBR, of Hoyt Chiropractic in Murrieta, Calif., believes the quality of chiropractic radiology film is improving, though there are still challenges. That anonymity may change as chiropractic radiologists seek opportunities to share common ground with the medical radiology community in hospital and research space. For example, Terry Yochum, DC, DACBR, FACCR, served as vice president and president of the ACBR for seven years. He is currently director of the Rocky Mountain Chiropractic Radiological Center in Denver and an adjunct radiology professor at Southern California University of Health Sciences, a chiropractic, acupuncture, and oriental medicine school. He has been on staff at the University of Colorado School of Medicine’s radiology department as a skeletal radiologist since January 1991. Yochum says imaging centers to which chiropractors refer their patients often use chiropractic radiologists to assist them in interpreting studies along with the medical staff. He says it is beginning to happen around the country that a chiropractic radiologist may work in conjunction with a medical imaging center to assist in referrals and interpretation of exams for chiropractors. Still, it’s true that there simply aren’t that many chiropractic radiologists around. In New York, Jean-Nicolas Poirier, DC, DACBR, and Chad Warshel, DC, DACBR, recently earned clinical teaching privileges in the Canandaigua VA Medical Center. They will teach radiology to chiropractic students and residents as part of the college’s master’s program in diagnostic imaging residency. They are the first doctors credentialed by the VA to do so. New York Chiropractic College interns and residents will be given the opportunity to view a broad variety of radiographs and advanced imaging of the VA’s chiropractic patients. One question asked in the medical radiology community is how well can a chiropractic radiologist interpret images? While plain radiography of the spine is an established part of chiropractic practice, few studies have been done to indicate chiropractors’ ability to read plain radiographs. — Peter Hildebrandt is a freelance writer based in Rock Hill, S.C.
Chiropractic is a hands-on therapy based on the theory that subluxations in the spine may cause many medical disorders (especially disorders of the nervous system). Chiropractic medicine originated in the late 1800s in the United States. Chiropractic treatments usually involve adjusting the joints and bones in a person’s spine using twisting, pulling, or pushing movements. Some chiropractors use heat, electrical stimulation, or ultrasound to help relax the person’s muscles before doing a spinal adjustment. The primary theory behind chiropractic therapy is to help the body heal itself by correcting subluxation of the joints, particularly the bones of the spine (vertebrae). What is chiropractic used for? Research has shown chiropractic therapy to be effective in treating low back pain and to be helpful in treating neck pain and headaches. The effects of chiropractic treatment on nonspinal conditions, such as high blood pressure or asthma, have not been scientifically proven. Discuss with your chiropractor any potential risks associated with chiropractic treatment. Side effects may include minor pain or discomfort at the point of manipulation, headaches, and fatigue. Most of these effects go away within a day. Rare but serious problems, such as a herniated disc and cauda equina syndrome, may occur when chiropractic therapy is used to treat back pain. These conditions can cause pain, weakness, and numbness in the buttocks and down the legs. And they may affect bladder and bowel control. Rare but serious problems, such as a stroke or a tear in the artery in the neck, can occur when chiropractic therapy is used to treat neck pain. Chiropractic students must have a minimum of 3 years (90 credits) of undergraduate study before applying to a chiropractic college. After completing a 4-year program, the chiropractic student receives a Doctor of Chiropractic (DC) degree. Chiropractors are licensed in every state and must pass a four-part exam with the National Board of Chiropractic Examiners.